Pieza Teatral “Monseñor Romero. Conversión y Martirio”, Parte I. Iglesia Catedral Episcopal Trinidad, Portland, OR. Realizada por “SALUDO”, Salvadoreños Unidos de Oregon. 24 de Marzo de 2010. 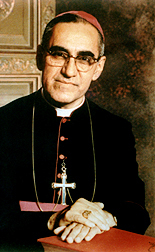 Theater piece: Monsignor Romero. Conversion and Martyrdom. Part 1. Trinity Episcopal Church, Portland, OR. Created by SALUDO, United Salvadorans of Oregon. This cabinet change has been extremely controversial. The PNC is a civilian institution that was created by the 1992 Peace Accord negotiations that ended the Salvadoran Civil War with the intention of removing the Armed Forces from any role in public security, specifically because of the long history of human rights violations by the military. On the heels of a US-inspired breakdown at the Summit of the Americas in April, the US claimed its seat as an observer at this weekend’s summit of Central American leaders. Secretary of State for Western Hemispheric Affairs Roberta Jacobson attended the 39th meeting of summit of the Central American Integration System (SICA) in Tegucigalpa, Honduras.